Jess Gordon is out for revenge. Last year the jocks from Knights College tried to shame her best friend. This year she and a hand-picked college girl gang are going to get even. The lesson: don't mess with Unity girls. The target: Blondie, a typical Knights stud, arrogant, cold . . . and smart enough to keep up with Jess. A neo-riot girl with a penchant for fanning the flames meets a rugby-playing sexist pig - sworn enemies or two people who happen to find each other when they're at their most vulnerable? Summer Skin represents the perfect balance of fierce, feisty and feminist in a YA novel. A book which seems to fit comfortably in the gap between young-adult and new-adult in the scope of university life, this story is one that is refreshing and dynamic. Taking a fresh look into the 'us versus them' sub-culture between universities and the sexes, this is a title you won't want to miss getting your hands on. Yes, there are books with the strong, independent female leads out there - but Jess Gordon is one of a kind, and so are her friends. Allie, Farren and Leane all have their own unique quirks and personalities, but the thing which bands them together is their feminine solidarity. This may be borne out of vengeance as old wounds imposed by the guys from Knights are not forgotten, but it is empowering nonetheless to see a group of such realistically characterised individuals. They're not perfect, but that's what makes them real. But Jess is more than just the sum of the people she hangs out with - she's intelligent in her own right as well. She's got the drive and ambition to go and invest her Telstra shares, and takes her grades at uni seriously. She talks about things like 'Heteroscedasticity' (whatever that means), and her views on things like sexuality and challenges the stereotypes placed on women in general. Kirsty Eagar has truly succeeded in tackling these wider issues at play in a way which isn't overly sanctimonious, and instead relatable. It's when 'Blondie' comes onto the scene which things really start heating up. This is a guy who appears to be the epitome of everything Jess has been thought to hate. He's arrogant, and on the outside pretty darn sure of himself...and oh so flirty. There is a romance involved in the story, but it isn't one which fits any of the usual cliches. It's one rife with each person constantly challenging the other, one where the ups and downs leave you hanging, and that ends up in a way which seems ultimately fitting. I won't say too much here - you'll have to read it for yourself! 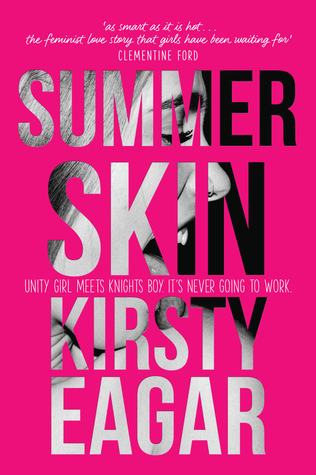 In the end, Summer Skin is a standout in Aussie YA. It pushes the boundaries regarding a portrayal of the subcultures which may be present in university life, and poses a refreshing storyline that is both emotionally charged and powerful. Perhaps it is the smart girls who do get what they want - and isn't that what we wish could always be true? Yesssss I have just read this one and totally agree with everything you've said here - it's such an important novel! I love the university setting and Jess as well. Great review Genie! Thanks Jeann - great to hear you loved it too!